NOTE: Date must be in the form YYYY-MM-DD, like 2019-04-13. If anyone out there has a small to medium size flat screen that is not working and is just sitting around taking up space, I would like to recycle some of the parts for a project. I took one apart a couple of years ago and I hope they still have the parts I want. 2019-04-13 - Louisville, KY - Photo by Pen. 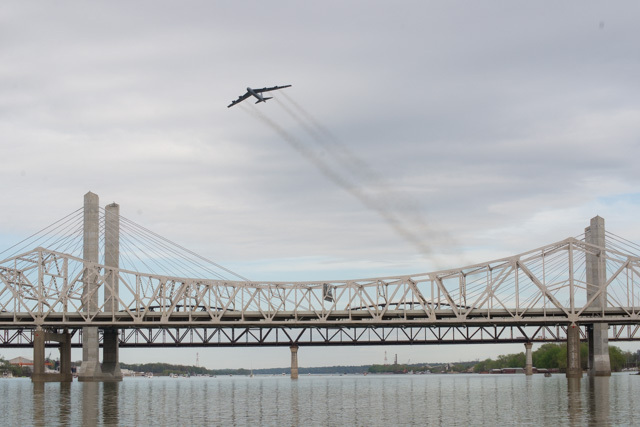 A B52 from the 2nd Bomb Wing Barksdale U.S. Air Force Base, Louisiana flies low over the Abraham Lincoln Bridge at Thunder Over Louisville on Saturday. The annual event kicks off two weeks of Derby Festivities. Wikipedia has this to say about the Boeing B-52 Stratofortress: "The B-52 has been in active service with the USAF since 1955. ...[and] completed sixty years of continuous service with its original operator in 2015. After being upgraded between 2013 and 2015, it is expected to serve into the 2050s." You�re invited to join us for an Easter Egg Hunt Sunday April 14, 2014 at 4pmCT/5pmET - that�s tomorrow - at Saloma Baptist Church, Campbellsville, KY.
Bring some plastic eggs with candy inside - come and enjoy some family fun and fellowship - invite children and family to join us - all are welcome. Hope to see you there!!! The No. 6-ranked Lindsey Wilson softball team took two games from Mid-South Conference opponent Shawnee State (Ohio) on Friday evening at Sparks Park. The Blue Raiders cruised in game one, defeating the Bears 9-1 as they recorded four home runs in the game. Game two was a different story as LWC found themselves trailing into the fifth inning but a late surge pushed them to victory. Cassie Matlock led the way for the Blue Raiders at the plate as she finished the day with four hits and six RBI's. Hannah Epperson (11-1) and Annabelle Ramirez (12-0) pitch complete games for the Blue Raiders as they picked up wins in game one and two, respectively. The Blue Raiders are set to finish off the weekend series with Shawnee State on Saturday at Marilyn D. Sparks Park, Lindsey Wilson Sports Complex, 928 Russell Road, Columbia, KY when they play a doubleheader beginning at NoonCT. Richard Edward Lee of Columbia passed away on Friday, April 12, 2019 at his residence. He was 89 years old. The funeral services will be held at 11amCT on Monday, April 15, 2019, at the Stotts-Phelps-McQueary Funeral Home, 210 Greensburg St., Columbia, KY, with Bro. Terry Smith officiating. Burial will follow in the Haven Hill Cemetery. Visitation will be on Sunday from 3pmCT until 8pmCT at the funeral home. Campbellsville, KY - In the first of many activities celebrating Earth Day at Campbellsville University, Dr. Matthew Sleeth, founder and director of blessedearth.org, said at chapel April 3, "Sabbath keeping is not a condition to get into heaven, but it's a condition that heaven is in if you get there." "What I have learned more than anything else is that the Sabbath is an act of trust." Sleeth was on campus for a Kentucky Heartland Institute on Public Policy (KHIPP) event April 2. Bill Hughes, who also works for blessedearth.org, led a mini-retreat at Clay Hill Memorial Forest April 4. Albany, KY - On April 11th, 2019, Trooper Jordan Carter received information about a subject trafficking methamphetamine out of a residence on KY 1576, 4 miles west of Albany, KY.
Tpr. Carter and Clinton County Deputy Chris McGuffin went to the residence and made contact with 33 year old Sharla Brown of Albany. Consent to search the residence was given, resulting in units locating glass bongs, digital scales, several small clear baggies, and methamphetamine. Williamsburg, KY - The Lindsey Wilson men and women's outdoor track and field complete day one of the UC Invitational in Williamsburg, Kentucky. The men's track team sits in sixth place with 22 team points, while the women's team is in eighth with eight points after day one. --Robert Stone, Saturday, 13 April 2019. Italian Pasta, Parmesan Cheese, Tossed Salad and Double Chocolate cake! As always, grownups are welcome to eat for a donation. Look for Adair County Elementary School's business ideas showcase!